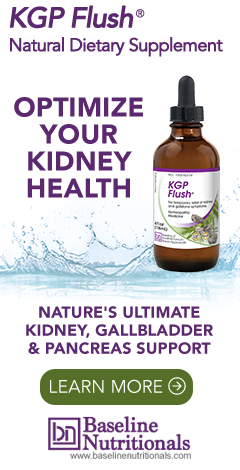 Did you know that millions of Americans suffer from kidney stone and/or gallstone problems? In fact, each year, more than one million people in the US learn they have gallstones. Overall, nearly 10% of the American population have kidney stones at some point in their lives, and another 10-15% have gallstones at any point in time. Each year, more than 300,000 people end up in emergency rooms for kidney stone problems and another 800,000 have surgery for gallstones. Luckily, nature has a remedy to help. For generations, chanca piedra has been used by the indigenous peoples of the Amazon for the treatment and removal of gallstones and kidney stones. In fact, the name chanca piedra, as it is known in Peru, comes from its effect on kidney stones and gallstones. The literal translation is "stone breaker." It effectively softens both kidney stones and gallstones for easy passage out of the body. It is also renowned for its diuretic qualities and has been shown effective at helping relieve edema and urine retention. This natural remedy has sparked the interest of researchers around the world, and since the 1960’s, over 300 studies have been carried out. The first research was conducted by Indian and Brazilian research groups, since the plant is indigenous to their areas. The Brazilian researchers summarized their research stating, "Pre-clinical and clinical studies carried out with the extracts and purified compounds from these plants support most of their reported uses in folk medicine for the treatment of a wide variety of pathological conditions." In fact, it’s so effective that, for a number of years, Jon Barron has recommended chanca piedra not only as a key component of his kidney flush formula, but also for using that formula before liver detoxing to soften gallstones before trying to pass them during the detox. It also works as an anti-inflammatory agent in the kidneys and as an antihepatotoxic to protect the liver. That is to say, it counters the effects of toxins in the liver. Its liver-healing properties have prompted research into its benefits in dealing with the Hepatitis B virus (HBV). For many healers, based on accumulated research, the herb is considered to be the most effective, natural, non-toxic remedy for HBV. Seeing as one out of every 250 Americans is an HBV carrier, this could make a huge difference in not only treating the virus but eradicating it as well. The hope for the herb is to provide an abundantly available nontoxic alternative not only to treat the disease but, ideally, to render carriers sero-negative for the virus so they won’t pass it on to others. Perhaps even more surprising is that some studies are beginning to indicate that chanca piedra may be just as effective when it comes to dealing with Hepatitis C.
For more on kidney care, click here. I have calcium/oxalate stones and have been using CP to try and dissolve one. for days in pure extract form. It did not affect the stone at all. I soaked the same stone in lemon juice and it dissolved in 30 minutes. I have read other reviewers who did the same experiment with the same results. I challenge you to find a stone or fragment of a stone to test this yourself or produce a paper that proves CP does soften or dissolve a C/O stone(most common). The other claims are correct and it has many positive benefits. There are three kinds of kidney stones: Calcium stones, Struvite or infection stones, and Cysteine stones. Each is dissolved in different ways and with different ingredients. That’s why Jon Barron recommends a formula for dealing with kidney stones as opposed to a single ingredient. Quote:The literal translation is "stone breaker." It effectively softens both kidney stones and gallstones for easy passage out of the body. Research done in Brazil at the Federal University of Santa Catarina in 1984 on Chanca Piedra revealed an alkaloid (phyllanthoside) in the leaves and stem with strong antispasmodic activity. It served as a relaxing agent for smooth muscles and they concluded that its spasmolytic action accounted for the efficacy of chanca piedra in expelling stones. Brazilian researchers have also discovered powerful, long-lasting pain-blocking activity in the roots. This is great stuff, but not for dissolving or softening any type of stone. Find some research that shows that CP dissolves stones. The toxicity of calcium oxalate is inhibited by the triterpenes of P. niruri. They, also, inhibit the markers of crystal deposition in the urinary system. Human urine contains CaOx crystals which clump in large crystals after 24 hours. When patients are treated with P. niruri, the crystals which form are not as large as in controls without treatment. There has been extensive testing of the effect of P. niruri on CaOx stones. At the very least, Phyllanthus causes the stone to be smoother and easier to pass through the urinary system. Thank you for your time and effort on this subject. All things discussed here are valid points for the use of CP as a preventative of stone formation throughout the body. I took it per chance as my mother and aunt both had gallbladders removed. I gave half the bottle to a friend who said she too, was facing gallstone/gallbladder removal. We live on an oil / gas extraction area, the crude salts stop at the gallbladder in women. She took it for a few weeks and accidentally ended up in "labor", more or less at her toilet at work. She was in immense amount of pain, then she flushed soft stool out her back end with such force she heard actual "tinks" within the toilet bowl. She was in so much pain she went to ER, naturally her boss called ambulance she was on toilet for long enough time. Next x-ray showed her stones were gone, and that she did not need surgery and she did not have to.lose her gallbladder. She even gave me the rest of tablets back she did not need. Now we laugh about it, and I always tell her I am sorry it happened at work. I don't know about kidney stones but I take this for gallstones. If I don't take it, the attacks come back and the last one lasted for 2 1/2 days!! It was awful! But I take this religiously and I am symptom free. I truly do not want surgery unless I absolutely have no other options. The gallbladder serves a purpose and I think it is wrong that the first thing doctors say is "Remove it!". I do know surgery is an option if needed but I will continue to take this wonderful herb as long as it works. I love it and would not be without it. I don't know about your testing with CP as compared to lemon juice but CP works for my gallstones. A friend has told me about the health benefits. He said, he has been using it to treat so many condition and has been very effective. Hi, I am wondering if this can desolve a small parathyroid tumor that is the result of high calcium? I have used it to pass a large kidney stone, a few years ago.. no surgery! Worked great! I have had one surgery 4 years ago for parathyroid already. Thank you! How large was your kidney stone, and where was it located when you first started taking the CP?